Need a tasty vegetarian recipe? Look no further! 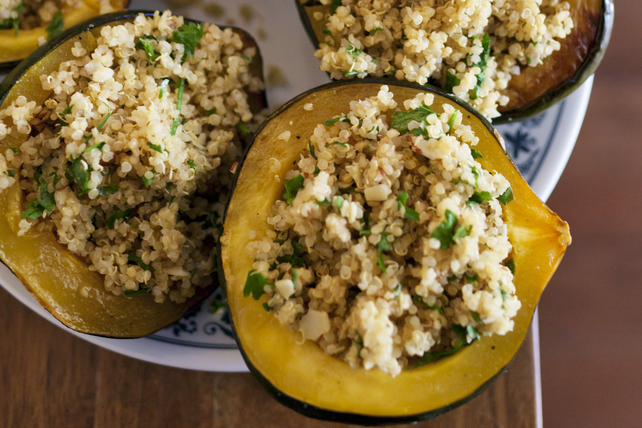 Our Quinoa-Stuffed Squash with Parsley & Feta recipe does the trick! Pierce squash in several places with paring knife. Microwave on HIGH 10 to 12 min. or until tender, turning after 6 min. Cool slightly. Meanwhile, bring water to boil in medium saucepan. Stir in quinoa; cover. Simmer on medium-low heat 13 min. Remove from heat. Fluff with fork. Stir in cheese, dressing, garlic and 3 Tbsp. parsley. Heat oven to 400ºF. Cut squash lengthwise in half; scoop out seeds. Place squash, cut sides up, in single layer in shallow baking dish; fill with quinoa mixture. Bake 15 min. or until heated through. Sprinkle with remaining parsley. Add 1/4 cup toasted pine nuts or toasted chopped walnuts to quinoa mixture before spooning into squash shells and baking as directed.